Digg.com, a hugely popular tech-news website, allows readers to submit content and decide what's interesting enough to be promoted to the main pages. 1) Digg Spy - Think of it as a real time version of Google Zeitgeist. It shows a live preview of activities by Digg members like who is writing comments or promoting a story or marking a story as spam. The digg spy for all stories can be too much to handle so you choose to spy just on front page stories. DiggAll provides a static view of recent submissions. 2) Digg for URL Citations This is just like Technorati Cosmos. Using Digg Citations search, Bloggers can do some ego surfing and discover which of their blogs posts have made to Digg.com. This feature is also useful when you like know the who broke the story on digg. Just type in the full URL in the search box. A small issue is that digg search treats digg.com and www.digg.com as separate URL. So you may want to repeat your URL search with and without the www part. 4) Track any subject on Digg using RSS If you are know RSS, you can consume the entire Digg-o-sphere without ever visiting the digg website. All popular digg categories provide RSS feeds. In addition to existing feeds, you can perform a keyword or URL based search and Digg will also generate an RSS feed for you. Make sure that you limit your search to only the top stories otherwise your web feed will be flooded with spam digg submissions. 5) Bookmark a custom Digg page Say you just interested in digg stories related to Yahoo but hate visiting the search page and typing Yahoo every time. The easy way is to search for Yahoo on Digg.com and press Ctrl+D to bookmark the page. So the next time you want to read Yahoo related stories on Digg.com, just open the bookmarked page in the browser. You can also add multiple search keyword but Digg doesn't support boolean search operators yet. 6) Top Stories on Digg for this month/week/year While the Digg.com homepage features the current top stories, you can also view top stories from the entire week, last month, current month or even the whole year. 7) Let other Digg users discover new websites for you Digg allows users to add friends and you can exploit this feature to find new amazing content on Digg without doing anything. The trick is to find an active member of Digg community that has similar interests. For instance, I know that if there is any interesting content about Google on Digg.com, Philipp Lenssen of Google Blogoscoped will digg it. 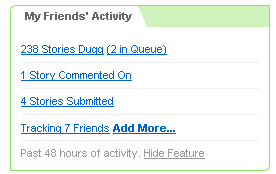 So I added him and other favorites like Kevin Rose and Amber MacArthur to my friends list on Digg. Digg provides a dashboard of what your friends are doing there - where are they posting comments, what stories are they digging or submitting. This feature is also accessible from your profile page. 8) Digg Cloud View When someone submits a story on digg, it's added to the Digg All page. If the story receives more that 40 diggs, it's promoted to the digg front page. So the digg all page is a wonderful resource for finding content that's fresh but not popular enough yet. Digg All also provides a Cloud View which is similar to the del.icio.us tag clouds - the more diggs a story get, the larger the font of the story title. 10) Use Digg as a Blog Editor If you enjoy reading a story on Digg, you can automatically post it on your blog without leaving digg. The title of the story on Digg becomes the title of your post while the short description becomes the body of your blog post. There will also be links to the actual story and it's location on digg. Just set your blog preferences on the digg account page. Digg support Blogger, MT, TypePad, LiveJournal and Wordpress Blogs. Hope you enjoyed reading it as much as I enjoyed sharing it. If you have any Digg tips, let me know.